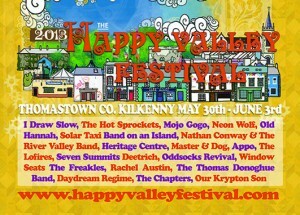 Now in it’s 8th year The Happy Valley Festival has firmly established itself as a welcoming and intriguing place to catch the best of rising Irish & international acts, whilst also enjoying many of the creative workshops, exhibitions, family entertainment and places of heritage that help to bring this scenic country town alive over the June Bank Holiday weekend. A stones-throw from Kilkenny City and nestling conveniently on the banks of the river Nore on the main Dublin-Waterford thoroughfare, Thomastown had long been recognised as the hidden creative hotspot of the south-east, thanks in part to it being home to the Grennan Mill Craft School also hosting their end of year show on the same weekend. Over the past 8 years artists from Snow Patrol to Lisa Hannigan, The Republic of Loose to The Hothouse Flowers have attracted crowds to the many beautiful beergadens of the town, but it is the up and coming acts from our shores and further afield who are taking this music and arts festival to another level. 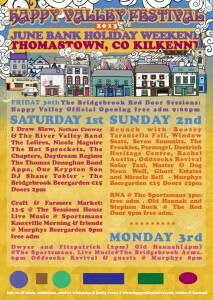 Sat 1st in The Bridgebrook Beergarden we are delighted to welcome Our Krypton Son , Appo, The Chapters, The Thomas Donoghue Band, Nicole Maguire, Lofires, Daydream Regime, The Hot Sprockets, Nathan Conway & The River Valley Band, Shane Tobler & I Draw Slow. Murphys Beergarden on Sun 2nd kicks off with Brunch with Boozey, followed by Tarantalla Fall, Window Seats, Seven Summits The Freakles , Permagrin, Deetrich, Heritage Centre, Rachel Austin, Oddsocks Revival, Solar Taxi, Master & Dog, Neon Wolf , Ghost Estates & Miracle Bell. Tickets, priced at a phenomenal €15 per day are available from the host venues & Rollercoaster Records from Fri 19th April. A special ‘early bird weekend ticket’ will be available´@ €25 until Fri 10th May. Details of camping facilities will be available on our website shortly. We also have a host of other free gigs & events from Fri to Mon with acts such as Knoxville Morning, Old Hannah, Stephen Buck, RNA , Dwyer & Fitzpatrick & more. Here are some of the acts to look forward to for Happy Valley 2013. To be in with a chance to win free tickets for the weekends music events please visit us on facebook……All info including day-by-day lineups will be available here shortly….